SHAN TURNER-CARROLL IS A TIME TRAVELLER; his means, the ‘primal crown’. Traditionally, crowns represent immortality – the triumph of life over death – either because the wearer is believed to ascend to glory in the afterlife or because their memory will live on in future generations. As symbols of authority they draw on the aspirant notion of victory over time itself. Whether they are constructed of jewel-encrusted precious metals or the ephemeral beauty of flowers that die to be reborn each year, crowns symbolise continuance. Shan Turner-Carroll’s ‘primal crowns’ are woven (some, quite literally) from the strands of past and present. Their value lies not in the extrinsic economies of gold and gems but the intrinsic worth of personal heritage. With Anglo-Burmese antecedents and strong family ties to Papua New Guinea, Shan was born to a nonconformist family that broke the conventions of colonial society by living among the native peoples as active participants in village life. Indeed, his parents affirmed this connection by naming their son after the Shan, a Tai peoples who have inhabited the hills of Burma for a millennium. Today, he and his family live on their property in the Hunter Valley region of New South Wales in a mud-brick home they built themselves. It is within this setting that these photographs were made. 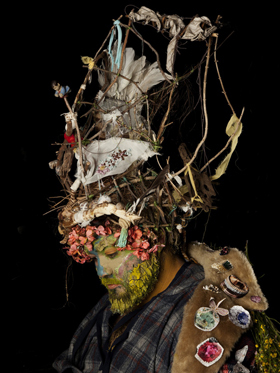 DRAWING ON TRADITIONAL SKILLS of making passed down to him from preceding generations and cultures, and a resourcefulness born of personal exploration, Shan Turner-Carroll constructs elaborate regalia from objects and materials that have special meaning for the individual subject. A floor rug becomes a regal mantle; a childhood toy a priceless ornament; ears of wheat form a diadem. Each family member is adorned with symbols of their past and present, as the prosaic of daily life is synthesised to compose the eclectic visual poetry of a ‘primal crown’. Set within the landscape, but swathed by nocturnal blackness, the figures are both idiosyncratic and archetypical; local and universal. The ‘Primal Crowns’ are not the showy credentials of political correctness, but gentle parables of human connection on a journey that tracks across space and time. While they are enriched by cultural knowledge, they are shaped by an intuition born of personal experience that engenders a fertile consilience of enduring tradition with contemporary imagination. The creativity and craftsmanship that go into their making are, as Shan Turner-Carroll puts it, “quietly part of me”. The Doctor Harold Schenberg Art Prize you were just (and justly!) awarded is a fitting “jewell in your crown” Shan!! Your work is truly creative, thought provoking and inspirational Shan. To be able to turn your life experiences, thoughts and philosophy of life into such superb art works is a true gift. Thank you for sharing with us all.